Charles H. Smith, Ph.D., Associate Professor, Western Kentucky University. The author has graciously shared with readers of the Victorian Web this essay from his rich Alfred Russel Wallace site, which contains extensive bibliographies of primary and secondary materials, a section on frequently asked questions, and a wealth of primary documents and portraits. Alfred Russel Wallace (1823-1913), British naturalist, evolutionist, geographer, anthropologist, and social critic and theorist, was born 8 January 1823 at Usk, Gwent (formerly Monmouthshire). He was the third of four sons and eighth of nine children of Thomas Vere Wallace and Mary Anne Greenell, a middle-class English couple of modest means. The older Wallace was of Scottish descent (reputedly, of a line leading back to the famous William Wallace of medieval times); the Greenells were a relatively unremarkable but respectable English family that had lived in the area for generations. Thomas Wallace had trained for the law (and actually was sworn in as an attorney in 1792) but never practiced, income from inherited property securing him a life of leisure for the first fifteen years of his adulthood. With his marriage in 1807 things quickly changed, however, and he was forced into the first of what would turn out to be a long series of relatively unsuccessful ventures, including the publication of a literary magazine. Young Alfred's childhood was a happy one, but at times difficult for lack of money. Four of his five older sisters did not live beyond the age of twenty-two, and Wallace himself was not always in the best of health. He found the grammar school he attended in Hertford rather tedious, but for a time was privy to plenty of good reading materials, his father being a town librarian for some years. About 1835 the elder Wallace was swindled out of his remaining property and the family fell on really hard times; young Wallace was forced to withdraw from school around Christmas 1836 and was sent to London to room with his older brother John. The ensuing several month experience was critical to his future intellectual development, as there he first came into contact with supporters of the utopian socialist Robert Owen. In his autobiography My Life he recollects that he even once heard Owen himself speak; from that point on he would describe himself in disciple terms. By mid or late 1837 he had left London to join the eldest brother, William, in Bedfordshire. William owned a surveying business, and Wallace was to learn the trade. In 1839 he was temporarily apprenticed to a watchmaker, but by the end of the year he was again working with William, now based in Hereford. Over the next several years he picked up a number of trades-related skills and knowledge, particularly in drafting and map-making, geometry and trigonometry, building design and construction, mechanics, and agricultural chemistry. Moreover, he discovered that he really enjoyed the outdoor work involved in surveying. Soon he was starting to take an interest in the natural history of his surroundings, especially its botany, geology, and astronomy. 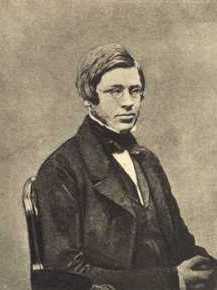 While working in the area of the Hereford town of Kington in 1841 he became associated with the newly-formed Mechanic's Institution there; some months later, after moving over to the Welsh town of Neath, he began attending lectures given by the members of that area's various scientific societies. He also involved himself with the Neath Mechanics Institute, eventually giving his own lectures there on various technical and natural history subjects. The early 1840s also witnessed his first writing efforts: an essay on the disposition of mechanics institutes written about 1841 found its way into a history of Kington published in 1845; two of his other essays from this early period are discussed in his 1905 autobiography My Life. In late 1843 a slow work period forced William Wallace to let his brother go. Alfred decided to apply for an open position at the Collegiate School in Leicester, where he was hired on as a master to teach drafting, surveying, English, and arithmetic. Now commenced another period central to his future path. Collegiate School had a good library, and there he was able to find and digest several important works on natural history and systematics; moreover, sometime during the year 1844 he made the acquaintance of another young amateur naturalist, Henry Walter Bates. Bates, though two years younger than Wallace, was already an accomplished entomologist, and his collections and collecting activities soon captured Wallace's interest. Around the same time Wallace saw his first demonstration of the practice of mesmerism, then dismissed by most as illusion or trickery. On investigating, however, he found he could personally reproduce many of the effects he had seen exhibited on stage, and learned his "first great lesson in the inquiry into these obscure fields of knowledge, never to accept the disbelief of great men, or their accusations of imposture or of imbecility, as of any weight when opposed to the repeated observation of facts by other men admittedly sane and honest." In February of 1845 his brother William died unexpectedly and Wallace quit his teaching job at Leicester to return to surveying, now going through a boom period. But he soon found that running the business, even with the help of his brother John, involved responsibilities (such as fee collection) that he hated. He still had enough spare time, however, to continue with his natural history-related activities, and was even made a curator of the Neath Philosophical and Literary Institute's museum. He also kept up a correspondence with his friend Bates. A new book by William H. Edwards entitled A Voyage Up the River Amazon suggested a way out of his situation: he would turn professional and launch a self-sustaining natural history collecting expedition to South America. Bates was enlisted (undoubtedly with little effort), and the two young men (at the time Wallace was 25 and Bates 23) left for Pará (now called Belém), at the mouth of the Amazon, on 25 April 1848.